Gonzo's Quest is one of the most popular slots in the world throughout the ages. It was launched as early as 2010 and then took the entire casino world by storm. Even today, the game remains on all top lists of the most popular casino games around the world. Gonzo's Quest was launched by the Swedish Net Entertainment and was also one of the first slots that became available even for mobiles and tablets. Gonzo's Quest is not a traditional video slot, on the contrary, it came as a new fresh game into the casino world when it was launched. True, the very reason is traditional, because the game has 5 reels, 3 lines and 20 paylines, but the game's theme, design and innovative game idea make Gonzo's Quest something extra. 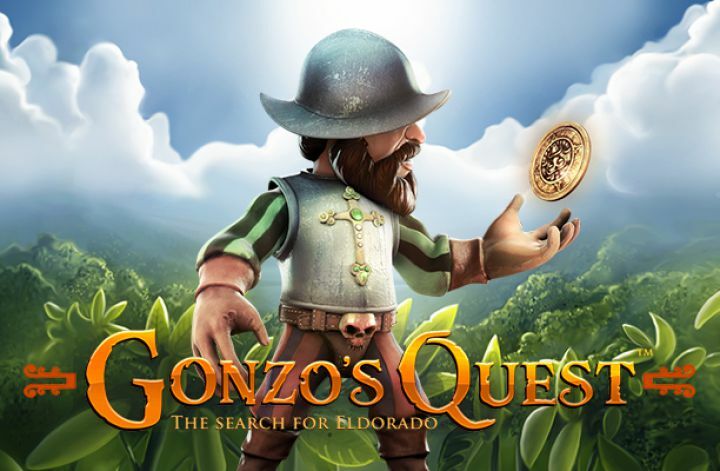 The game figure Gonzo is a Spanish conqueror located in the jungles of the South American Amazon to look for Eldorado, the mythical city of gold. This will tell you that Gonzo's Quest contains an animated intro that tells this story to the player. The theme of the game is maintained by using no ordinary spinning wheels with symbols, but instead using falling stone blocks with different motifs inspired by Inca culture. Even the background music follows the theme of jungle sounds and tones from panflutes. When a winning combination pops up, the rocks are powdered and go up into smoke in the form of a well-made animation. This is a special feature of Gonzo's Quest called avalanche. Once the stones have gone up in smoke, new stone blocks fall from above and replace the old ones. This means extra winning chances because new symbol combinations are formed. You can get several avalanches in a row and then a multiplier will be activated that will allow you to win up to five times the line bet. The game has high quality 3D graphics and Gonzo is also depicted in 3D to the left of the wheels. Most online casinos have Gonzo's Quest in their game range, and there are often free spins and bonus campaigns for this popular game so it's easy to try and see if this will be a favourite game for you too. To start playing, select the coin value and the bet level. Then, just start the game. Like most other slots, try to get at least three symbols in a row starting from the left. There are five different levels of action and six different coin values. The minimum coin value is 10 c and the highest coin value is 5 USD. If you bet the maximum number of lines and the highest bet level, it means that the maximum winnings are 500 USD per spin. There are seven common symbols, in the form of plates in different colours. They have different values. Blue is worth the most and then comes, in falling value, green, brown, purple, yellow, pink and grey. In Gonzo's Quest there is also a bonus label called Free Fall and a wild symbol. If you get three Free Fall symbols in a row starting from the left, the Free Falls function will activate and you will get 10 free spins. Then there is a hole in the wall of stones and Gonzo gets free passage. The fun is that if you're lucky you can get new Free Spins while you're in Inka Empire, and with the Avalanche feature it means you can get up to 15 times as many Free Spins. The wild symbol can replace all the common symbols. Gonzo's Quest has a payout rate of 96.1. The game has a relatively high risk. It can certainly take a while until the bigger winnings, but on the other hand you have a chance of winning really great Gonzo's Quest. If you get Free Spins and the multiplier is activated you can be rewarded! The best thing about Gonzo's Quest is that it's so well-made and that game makers have really spent a lot of time creating a nice and different jungle theme with effects, animations, sounds and special features that all hang together. The theme and background history make it take longer between spins. If you want a short time between spins and chance for many small wins, Gonzo's Quest may be your first choice, but if you want a fun gaming experience and a great gameplay with great winnings, then you should take a closer look at Gonzo's Quest. Gonzo’s Quest Free Spins No Deposit on The Grand Ivy Casino – NEW! Gonzo’s Quest Free Spins No Deposit on Wink Slots Casino – NEW!